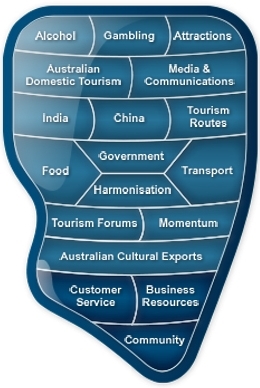 In the 21st century – the Asian century – Australia will receive millions of Chinese tourists. China is one of the great food-loving nations of the world, the quality of the food Chinese tourists eat here will greatly impact their enjoyment of their trip. A Chinese/ Australian journalist has said the Chinese people will often say ‘In food we trust’, a play on words to America’s ‘In God We Trust’. The matter of the restaurants in public land leases being either a source of pride or a source of shame to the community is of ongoing interest to The Tourism News. I’m not sure which is more annoying. Having waiters force-feed (sell) drinks or not being able to get hold of the stuff when I actually want to buy it. Today the latter seems the more egregious sin. Our lunch window is brief; we have a starter before us; and, to be honest, I expect to have someone offer me a vino by this point of the meal. Just offer, you know. It’s a win-win, on the whole. But no. It’s semaphore and a question to the one waiter who manages to recognise this universal signal of distress. “Would you like to sell me some wine?” Uh, sure, OK. We’re at Mures Upper Deck, me and a mild-mannered cousin whose easygoing, glass-half-full nature is the quintessence of old Tasmanian good manners. Nothing fazes Charlie. Yet by the time lunch is over his remark rings in my ear like the wind howling through the shrouds of nearby yachts: “I can’t remember the last time I was so annoyed by a restaurant.” Me too. Mures has been leasing this prime bit of public land for a long time; I’d call that a responsibility to the community. Once a small and apparently charming family operation in Battery Point, Mures moved to the docks many years ago and went into the business of Tourist Food. There’s a queue-and-pay bistro downstairs, a fresh seafood outlet, and the smarter dining room upstairs. A sushi shop is sublet to an independent operator. 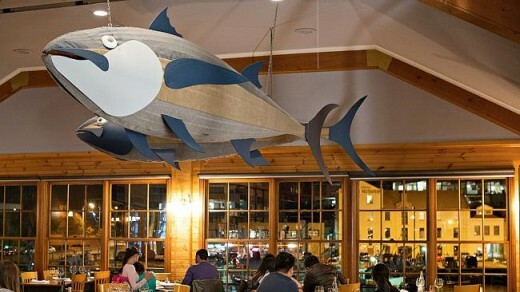 The reputation of the business is built around the Mure family’s heritage as local fishermen and deck-to-dining room restaurateurs, and anywhere you look that message is reinforced. Fair enough. We’re heading upstairs for the city’s premier seafood experience, and nothing’s going to stop us. I’ve walked past Mures a thousand times in the past 25 years yet never set foot inside. Mures Upper Deck is a Hobart institution. They must be doing something right? Not really. As I enter, Billy Joel’s Piano Man is on the sound system. Perfect. From the indifferent food — a kind of expensive form of fry and shred pub grub — to the less than indifferent wait staff who hover in clusters at the front of this barn-like, pine-lined space, hoping not to catch anyone’s eye, or be asked difficult questions about the produce, like “where’s the flathead from?” (Answer: “I’ll have to find out”), it’s quite difficult to see where Mures Upper Deck fits into the modern hospitality matrix. Other than servicing tourists, who make up a fair whack of its clientele this day. These are the highlights: 1. Being told, after a second trip to the oracle by one of our four waiters, that the flathead is “normal flathead”. 2. Asking for one of the three cheeses on offer (Bruny Island’s 1792) and being told: “If the chef’s not in the mood, it just won’t happen.” He wasn’t. It didn’t. 3. A bottle of Parish Vineyard 2014 Riesling from the Coal Valley region that is delightful and sensibly priced. For the record, we have wet, fully detached, virtually tasteless oysters topped with smoked salmon, salmon roe and piped cream cheese. Deep fried squid (salt and pepper, really?) in a clumsy faux Vietnamese salad with lots of that famous Vietnamese vegetable, the alfalfa sprout. A “smoked fish pate” consists mainly of cream cheese, with vivid sauces on the plate. “Mures fish and chips” ($37.50), which is good fish and a festival of deep-frying, including battered chips. And the “normal flathead”, which is oven-roasted, decent fish, served with potatoes and salad and runny, lemony emulsion. Dessert is a brûlée of some kind that would have been fine if it wasn’t chilled to the core, caramelised to order straight from the coolroom. Rarely do I go to a desk to pay; it seemed the path of least resistance. By the standards of its industry, Mures Upper deck is a restaurant dinosaur. Bring on the ice age. Or the meteor. Whatever it was that changed things forever.